The Walking Dead’s Steven Yeun is having a pretty good Post zombie apocalypse career. If you haven’t already seen Okja on Netflix, you really should take some time to check it out this weekend. Beyond that, he’s got Mayhem coming out on November 10th. 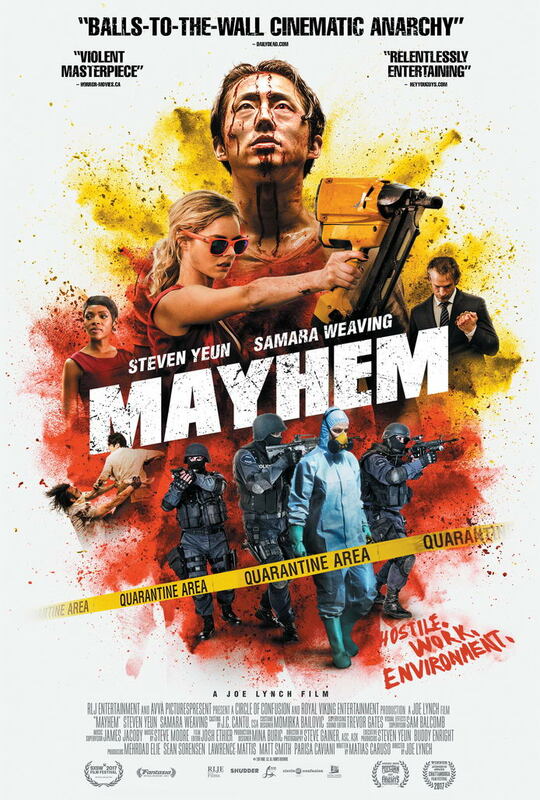 From what we can tell, Mayhem isn’t going to be an Oscar contender or anything like that, but it looks like it’s going to be a hell of a lot of fun. It’s basically a balls to the wall action film where Yeun and “Ash vs Evil Dead” actress Samara Weaving are trapped in a quarantined law office full of people infected by some sort of zombie virus and they have to kill their way to the top floor to get answers from the executive baddies. It’s being billed as a horror comedy, and I’m really looking forward to seeing Yeun get a chance to do more funny stuff.